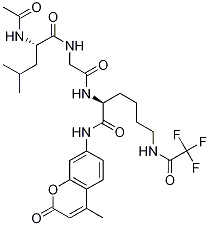 Tinostamustine, also known as EDO-S101, is an alkylatlng histone-deacetylase inhibitor (HDACi) fusion molecule. ACY-775 is a potent and selective inhibitor of the of histone deacetylase 6 (HDAC6) with an IC50 of 7.5 nM. HDAC-IN-6 is an HDAC inhibitor, targeting HDAC2, HDAC3, HDAC4, HDAC5, HDAC7, HDAC8, and HDAC9. Apicidin, a natural fugal metabolite, is a selective inhibitor of HDAC. 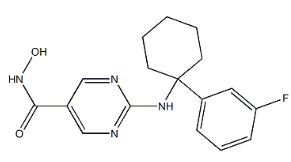 TH34 is a potent HDAC6/8/10 inhibitor. 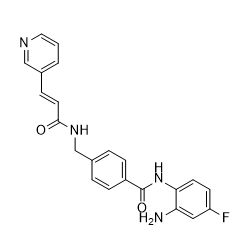 Tucidinostat is a potent and orally bioavailable HDAC enzymes class I (HDAC1/2/3) and class IIb (HDAC10) inhibitor, with IC50s of 95, 160, 67 and 78 nM, less active on HDAC8 and HDAC11 (IC50s, 733 nM, 432 nM, respectively), and shows no effect on HDAC4/5/6/7/9. 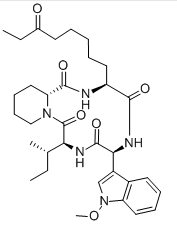 Givinostat is a HDAC inhibitor with an IC50 of 198 and 157 nM for HDAC1 and HDAC3, respectively. MPI-5a is a potent selective inhibitor of HDAC6, and poorly blocks other HDAC enzymes.